The below list are all things I use with my iPad, but you could just as easily use a phone, desktop or Google Glass for your education, I just like the size and ease of the iPad. Also, while I have spent time on pay sites like Lynda and in college had access to sites like JSTOR, I’m only going to list sites below that are free for anyone to use. More important perhaps than consuming information with this fun device is consuming quality and educational information. That’s why below I’ve put together this list of apps and sites that one can use to supplement as a free online education. A degree can be helpful, of course, in getting you a job somewhere, but now you can get an education on your own with just an iPad and internet connection. In many ways, this arguably trumps the old self-educating process of a person and a pile of books (or a library card). An online education may not come with a certificate or degree but can be just as empowering in a plethora of other ways (and is obviously a lot less expensive than college). So here we go. First off, I’m pretty hooked on Ted Talks. The videos live online within Ted’s website and many are on YouTube as well as streaming on podcast (I personally use Instacast to listen to podcasts on my iPad, but for TedTalks I like seeing the videos, as the presentation often includes a keynote of some kind). Ted Talks began in 1984 and have since grown in scope and in audience size, as the conference has now found a new home online. The length of the videos encourages to-the-point sharing of ideas that speakers think can and should be spread. Wi-Phi or “Wireless Philosophy” is another site I really like that’s run by Yale and MIT Philosophy departments. Wi-Phi is very similar to the Kahn Academy in that they both produce short educational explainer videos, except that Wi-Phi is focused entirely on Philosophy topics, and is a newer site so the amount of content still leaves one wanting for more. I like what they have though, and the idea should be expanded upon. Created by Salman Kahn in 2006, the Kahn Academy quickly proved itself incredibly useful in tutoring students for many core classes. Kahn’s videos were among the first to show the impact it can have to switch the routine to watching a lecture at night while students are home and freeing class time at school to active coursework so that teachers can help walk students through their problems, rather than handing out the work as students are on their way out. By no means do these videos get rid of the need for schools and teachers, but it does help many people who otherwise would not have access to such direct explanations for how certain things work. This, I believe, speaks to Ken Robinson’s view above (in Ted Talks section) that teachers need and deserve more freedom during class to teach. Perhaps having standardized content available at any time for refreshing your knowledge is useful in freeing some time, if not getting rid of the standardized tests and curricula themselves. Even for non-students, watching the Kahn videos on math, science, humanities or a growing list of other topics can be helpful in familiarizing yourself with the topic at hand. 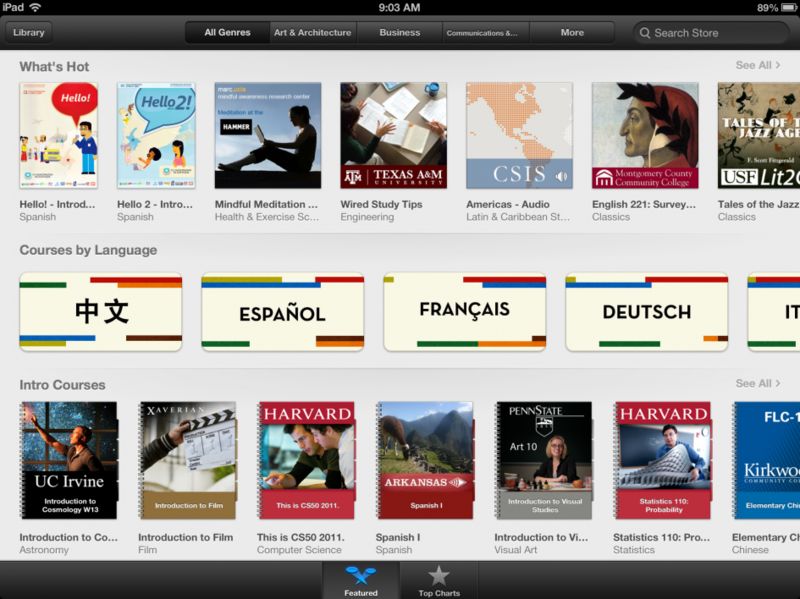 iTunes U is a fantastic app for the iPad that allows you to subscribe to any number of courses that have been uploaded to the site. Similarly, teachers may use this resource as a way to upload teaching materials and supplement their in-class experience for students. Some courses have video, some have audio lectures, others written materials and there is no standard. You can learn about just about any topic for free, and the app is well designed and easy to use. Listing Reddit here is almost like listing YouTube channels to follow (which may actually be a good idea for a future post) since there is a lot of crap and nonsense on the front page of Reddit. Nevertheless, this is the last site I’m listing on this post, and for good reason. Sign up for an account on Reddit, unsubscribe from most of the default subs and then subscribe to the subreddits that interest you. Use an iPad app like AlienBlue to scan Reddit and it can actually help you find interesting and educational links, videos and articles as well as help you kill time. Here are a few of the subreddits I follow and suggest: /r/Philosophy, /r/Writing, /r/Technology, /r/Entrepreneur, /r/Howto, /r/Graphic_Design, /r/Iwanttolearn, /r/Meditation, /r/History and /r/Education are just a few examples of what I like to follow, but there are tons and tons of other subreddits that can be helpful for a variety of topics, so I suggest using the site if you don’t already, and also checking out the links for the rest of the above list.